The UK Independence Party has called for the elections minister to resign in a row over folded ballot papers. UKIP says hundreds of people could not find the party's box as it was hidden under a small fold at the bottom of the list of European election candidates. The party says it may challenge the result and says minister Michael Wills did not do enough to sort it out. The government says returning officers run elections and an alert had been put out once the problem emerged. In a letter to Mr Wills, UKIP leader Nigel Farage said: "We are outraged that today's European election have not been contested on a free and fair basis. "We have been swamped with upset voters who failed to find us on the ballot paper. In many cases they have voted for other parties such as NO2EU and even the BNP." He said in some cases ballot papers were "machine folded and with a sharp crease". "A good pair of fingernails were needed to prise open the last page," he added. The party says it is gathering information from across the UK and may issue a legal challenge to demand a rerun of the election. Mr Farage said he had tried to contact Mr Wills but was rebuffed with the message that the problem had "already been handled" - something the UKIP leader rejects. He said Mr Wills' "total refusal" to meet him to resolve the matter showed he was "unfit to remain in office" and should resign. A number of people, mainly from the Yorkshire and the Humber region, contacted the BBC about the problem. One man from York told the BBC he had been "absolutely shocked" that he could not find the party he wanted to vote for on the ballot paper and had to ask officials where it was. "They explained you have to unfold it again, right at the very bottom there was another very neat fold that you could not see, folded backwards," he said. During the day the Electoral Commission issued an alert to returning officers, advising them papers should be handed out unfolded, after the issue was raised by UKIP. A spokesman for the commission told the BBC they were "aware of the issue - and the general issues that long ballot papers can cause". He said ballot papers were folded to help protect secrecy. The Ministry of Justice said that the government was responsible for "setting the legislative framework" for elections, and for funding them. Returning officers were responsible for conducting them and it was important they were independent, it said. The department said there were no strict rules on how a ballot paper should be folded and it was clear that in some areas there were lots of candidates which meant ballot papers were extra long. It added that providing guidance on the conduct of elections was a matter for the Electoral Commission which had quickly issued a circular asking polling staff not to fold the papers when the problem emerged. "It is also worth bearing in mind that an enlarged copy of the full ballot paper is on display in every polling station," a spokesman said. 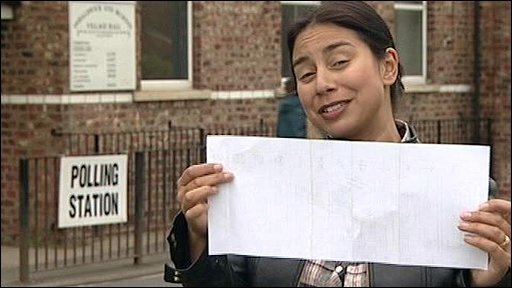 "Polling station staff also have to hand an enlarged copy of the ballot paper which is available on request."